In the still of the night-W.I.S.E. Project 2016 – Dancing in the rain! I woke early to the soft tap of rain on the cabin roof. I boiled water outside on the bbq and made the most fabulous camp coffee ever made. I built a big roaring fire in the wood stove that has quickly lulled my husband back to sleep. My daughter is gently snoring in the loft. I am curled up with a soft blanket sipping coffee on a comfy chair by the fire. I am charmed by the crackle and snap and the serene quiet of this wooded retreat and I am full of gratitude. I want to go for a quiet walk in the woods and find the little waterfall the owners told me about but I am a bit nervous knowing that there is a mama bear and her cubs close by. The owners of the cabin say they haven’t seen them by their house but they like to eat from the neighbors fruit trees. I would love to see them from a distance but not face to face alone in the woods. I circled the immediate area and delighted in birdsong and the sounds of nature instead of early morning traffic. This cabin gives the illusion of being deeper into the wild than it actually is. It is a short drive or five minute walk into the woods so once you are here you feel very far away from the stresses of everyday. Our hosts Chantal and John put a great deal of love into this little getaway and it is evident in the little touches. The solar power is something that I wasn’t familiar with but besides a few common sense things it is pretty straight forward. Want not, waste not! I know it is not my family’s cup of tea and they humor me a lot, but the truth is when you take away electronics, clutter and conveniences we are forced to live in this moment instead of the next one and we connect more as a family. They cannot deny it. The fact that my husband has drifted off into untroubled slumber several times this morning alone speaks volumes. Last night we had a tasty camp dinner and played 5 second rule and charades. There were a lot of laughs and I was happy for the quality family time. Our daughter was terrified of going to the outdoor washroom and hadn’t peed once between four and midnight. She is such a city girl. She insisted she didn’t need to pee at all but I dragged her out there and she managed to not get murdered or eaten by bears. 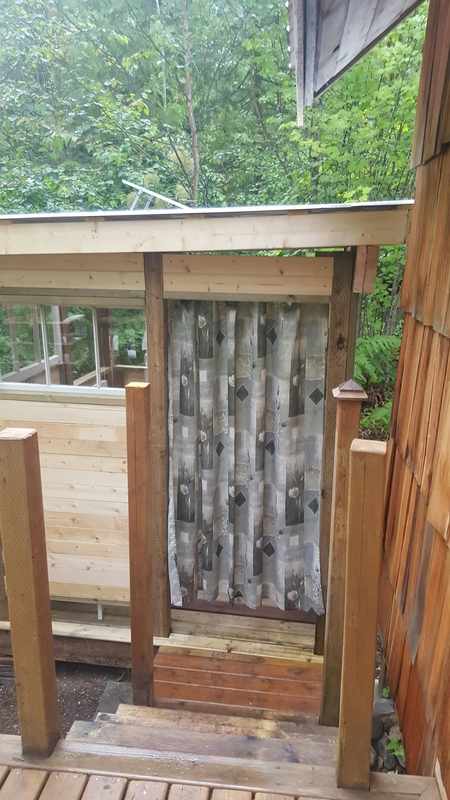 She made us barricade the doors so that mice, bears and woods cabin murderers couldn’t get in and thank god because we are all living this morning. Despite her fears she fell asleep almost immediately after settling down in the cozy loft. I caught her talking in her sleep several times. The still of the night here is very still. Though I was up early because it is light in here with all of the windows I feel extremely rested. I am immensely enjoying this place. It feels like you are miles away from everything which is clearly more of a comfort to me than it is to my daughter. I do think it is a memory that as an adult she will cherish and hopefully she will take her own family on similar adventures. When you are an adult you really appreciate getting away from everyday worries. She was quite excited to go to the beach today and though we originally thought it wasn’t going to be a beach day the sun won it’s battle with the grey clouds around 3 pm and it is quite gorgeous. 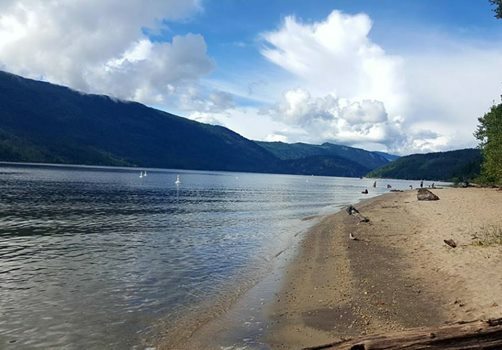 Mara Lake beach is located in Mara, between Salmon Arm and Sicamous in the Okanagan/Shuswap region of British Columbia. It has a white sandbar and deep blue water that is refreshing and rejuvenating. It is the first time my daughter forgot that she doesn’t have wifi. I loved swimming with her and watching her build herself into a sand mermaid. You cannot have that experience in the city. It is easy to be mindful in a place like this. The slower pace and lack of distractions forces you into it. The quiet and the soft glow of candlelight is not so bad either. 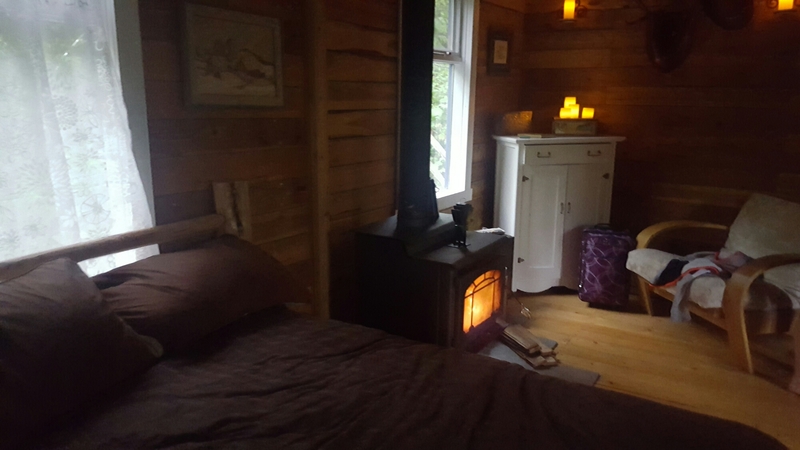 I would highly recommend this place for a quiet retreat or for a couple looking to reconnect. There is no fridge or stove but there is a bbq with a side burner and the cozy kitchen is quite equipt. Frankly there is a coffee pot and a wine opener so I felt very much at home. 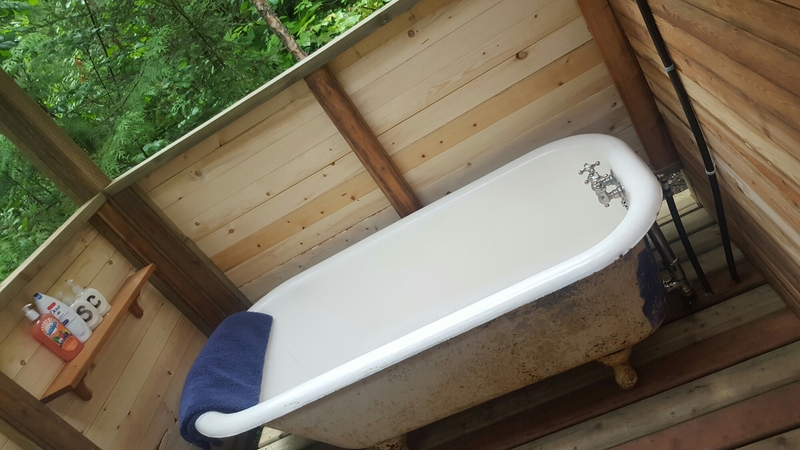 I am fascinated by the tiny house movement and the “less is more” lifestyle so this was an enjoyable experience for me. I talk about the Sweet sound of silence HERE, grab a coffee and have a listen. Just a reminder that the W.I.S.E. Principles for July are Welcome, innocent, special and enjoy. I hope you are welcoming new and exciting experiences, seeking innocent and guiltless adventures and quiet time to rejuvenate. Treat each moment as if it is special and unique and live in the moment fully before moving on to the next. Be W.I.S.E. friends. Chat soon.